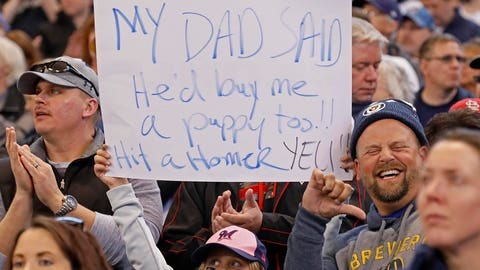 Sunday, March 31: A young Milwaukee Brewers fan holds a sign, pleading Christian Yelich to hit a home run. Spoiler: He did. 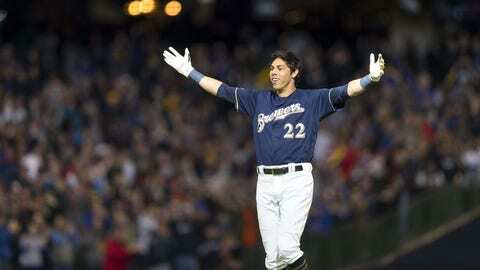 Sunday, March 31: Christian Yelich raises his arms in celebration after his walk-off RBI hit gave the Milwaukee Brewers a 5-4 win over rival St. Louis. 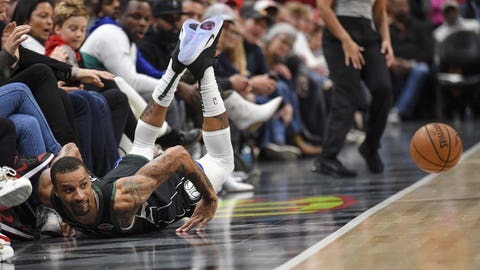 Sunday, March 31: Milwaukee Bucks guard George Hill scrambles for a loose ball during a 136-135 overtime loss to Atlanta. 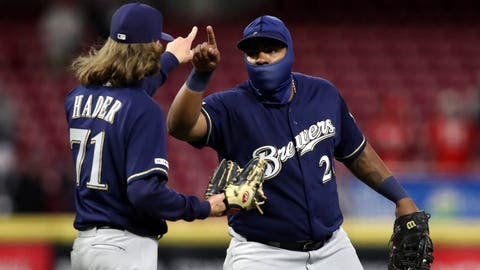 Monday, April 1: Jesus Aguilar and Josh Hader celebrate the Milwaukee Brewers' 4-3 win over Cincinnati. 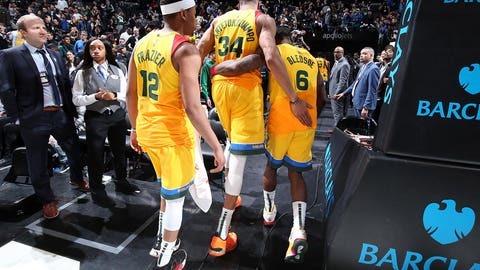 Monday, April 1: Giannis Antetokounmpo, Eric Bledsoe and Tim Frazier walk off the court after beating Brooklyn 131-121 at the Barclays Center. Tuesday, April 2: Lorenzo Cain congratulates shortstop Orlando Arcia who tallied his first hit of the 2019 season in Milwaukee's 4-3 win in Cincinnati. 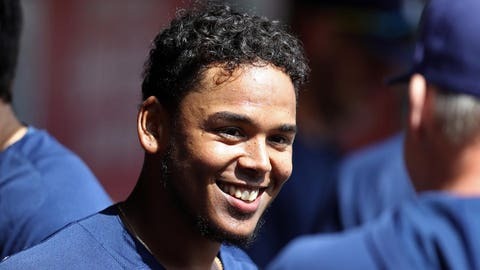 Wednesday, April: Milwaukee Brewers starting pitcher Freddy Peralta shined in his second start of the season, allowing just two hits and zero runs in a 1-0 win over Cincinnati. 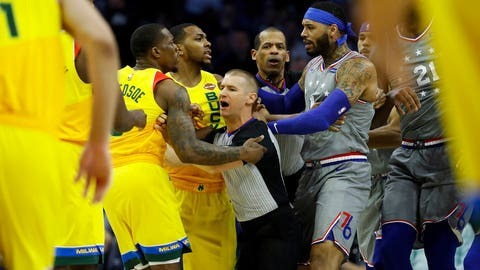 Thursday, April 7: Officials separate Milwaukee’s Eric Bledsoe and Philadelphia’s Mike Scott after a foul during the first half of the Bucks’ 128-122 win over the 76ers. 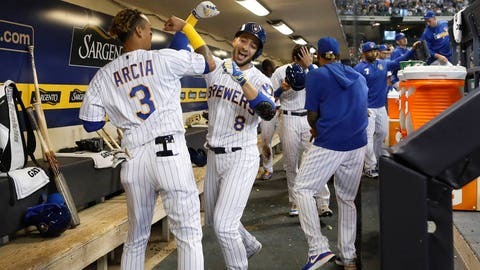 Friday, April 5: Ryan Braun and Orlando Arcia were among five Milwaukee Brewers players to hit a homer, tying a franchise record during a victory over the rival Chicago Cubs. 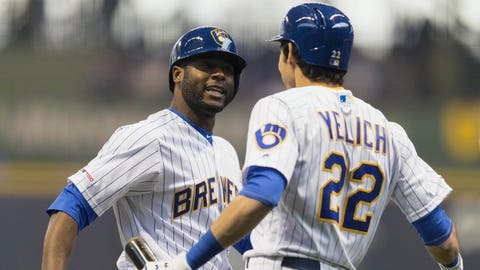 Saturday, April 6: Christian Yelich congratulates teammate Lorenzo Cain after he hit a leadoff home run against the Chicago Cubs.